"I am bound for the Promised Land!" 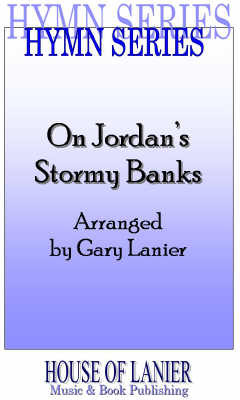 This joyful theme runs throughout this SATB arrangement by Gary Lanier. Starting with verse one, the arrangement takes an unexpected key change going directly into verse two, one less used, but with words that describe the true joy of the Promised Land, "All o'er those wide extended plains, shines one eternal day; There God the Son forever reigns, And scatters night away." With great praise the chorus begins... "I am bound for the Promised Land...". Another key change takes the choir into the last verse, and the final triumphant chorus, inviting all to come and go the the Promised Land! STANDARD OCTAVO $1.70 ea. BUY! IMMEDIATE DOWNLOAD, after purchase (if required). Use for review & learning parts. 1. No pianist is available. 2. Producing rehearsal CD's for choir members. TLC Emusic is your INSTANT ONLINE MUSIC RESOURCE! Sheet music includes Music Masters, printable on 8 1/2 x 11 paper, and an Unlimited Copy License. Upon receipt of online order and payment, PDF and/or MP3 music files are immediately sent through email. Music masters are shipped through snail mail. Or Call: 580.584.2889. Give your name, business, shipping & billing address, and the music order, including Quantity, Title, and Price.